Your one stop shop for all your plumbing, heating and air conditioning needs! 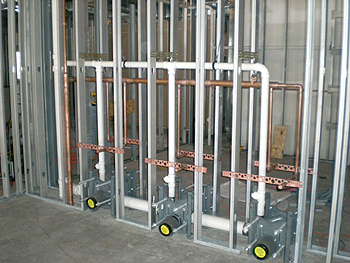 RHR is a full service plumbing contractor licensed in PA and NJ. We offer quality services from basic plumbing needs like drain cleaning and faucet repair to more specialized services, such as backflow preventer certification and video sewer inspection. We are experienced in residential and commercial plumbing, and we are proud to assist you in the plumbing needs of your business. From grease traps and large sinks restaurant sinks, to floor drains or showers for a gym or fitness club. We can help your business run more smoothly and efficiently by providing quality plumbing installation and maintenance. RHR Mechanical is always available for emergency service 24 hours a day, seven days a week! No matter the plumbing problem is, RHR is always ready to solve it. We service, repair and install all types of plumbing and heating equipment. What sets RHR apart from the rest is our commitment to deliver excellent service in a timely manner and at affordable rates.